Want to gather crowds at your next trade show? 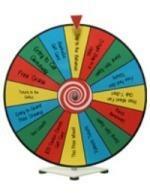 Nothing beats playing a fun and colorful game of spin the wheel! Attract the crowds with this 15-inch 10 Segment/ 18-inch 14 Segment/ WinSpin™ 24-inch 14 Segment Tabletop Color Dry Erase Spinning Prize Wheel! You'll hear oooh's and ahhh's from the crowd, making it the perfect piece to have for parties, birthdays, anniversaries, shows and so much more!